Fast-paced and dazzlingly imaginative, Dreamhunter will draw the reader into an extraordinary fictional world in which dreams are as vividly﻿ described as the cream cakes in the tea shop, the sand on the beach or teenage first love. 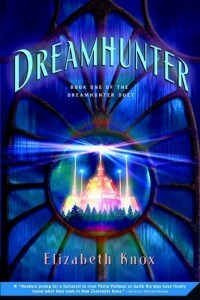 Set in 1906, Dreamhunter describes a world very similar to ours, except for a special place, known simply as The Place, where only a select group of people can go. These people are called Dreamhunters and they harvest dreams which are then transmitted to the general public for the purposes of entertainment, therapy – or terror and political coercion. Fifteen-year-old cousins Laura Hame and Rose Tiebold both come from famous dreamhunting families, but only Laura proves to be blessed with the gift and once inside The Place she finds out what happened to her missing dreamhunter father and reveals how the government has used dreams to control an ever-growing population of convicts and political dissenters. WN: What inspired the story? What was the spark that set off your imagination? EK: In mid 2002 I had a back injury. For months I was able to sleep only when I was absolutely exhausted, in effect every second night. It was a strange sort of sleep, the kind you have when you’re ill or very upset. Sometimes exhaustion seemed to put all the lights on in my head, I’d imagine I was awake, but I’d be kind-of paralysed and hallucinating. When the worst weeks were over I started writing a story about a young musician who had a fall, broke his leg and found himself in a strange, dry, stopped place where, while he was unconscious, he had a dream that later helped to heal him. I went on to write about his recovery and how everyone near him had the same dream while he was asleep. Then I thought, “What would happen if this man could go back and catch more dreams to share? What say there are adventurous and romantic dreams in this place too? Couldn’t this turn into an industry, like the early movie industry?” Then I decided to start the book twenty years after Tziga’s fall, when such an industry was up and running, and tell the story of Tziga’s daughter and her cousin. WN: You say on your website that writing fiction is like your son watching the lightening and saying, “Did you see that?” What is the lightening in Dreamhunter? What do you want your readers to see? EK: One thing Dreamhunter is about is that intoxicated sense of being transported or even transfigured by a story. Writing the book, I was in love with my dreamhunters, these people going about haunted, or in an exalted state, stuffed full of things people either desired, or were very afraid of. I wanted to talk about people whose work meant that they didn’t quite live in the world (dreamhunters aren’t expected to be as orderly or decorous as other citizens). And I wanted to talk about the grim thrill and dangers of keeping faith, as Laura does with her father’s wishes, and as Nown, her servant has to because of his nature. However, I should say that, being me, what I really wanted was for readers to care for the Tiebold/Hame family’s triumphs and troubles. And for them to get strong sensory impressions of what I was inventing – the Place and its stopped silence, the sunny paradise of Coal Bay; the opulent Rainbow Opera; the ‘hissing, sifting sound’ of the sandman’s walk. WN: I was fascinated with your treatment of the tradition of the “golem” and am intrigued with where you are going with that. Is it significant that he is made in The Place and yet there are hints his past constructs may have taken place in the real world? What are your thoughts about the enduring myths concerning golems? EK: I’d always wanted to do a golem. I love the myth of Rabbi Loew’s golem – how useful if was at first, and how dangerous later when it developed its own appetite for life. In my sandman I saw the opportunity to explore ideas about ‘artificial intelligence’ without having to do androids. Nown is a created being, who has to obey his creator. I was interested in how much freedom a being like that would have – for instance the freedom to withhold information that isn’t asked for, to respond correctly only to the right question or instruction. I was interested in the motivations of a being under a strict compulsion to obey, but who is also constituted by whatever his maker put into him at the moment of his creation – in Laura’s case sorrow and rage at what she sees as her father’s abandonment of her. It is highly significant that Nown is made in the Place – but I’m afraid I can’t really go into that, since that’s vital to the arc of the whole story. How important, to you, are dreams? And how important is it that people dream their own dreams, rather than have their thinking influenced by others? Is it possible to live in this world without having our thinking influenced or even manipulated by others? I’m a person who lives very much in, and by, her imagination. But of course my imagination is primed by other people’s imaginings, by books and films. I do think it is important that people own their dreams, for instance I’m alarmed (and morbidly fascinated) by the phenomenon of fan fiction – its solipsistic dependence on other people’s characters. But then I’m also impressed by the intensity of the fan’s engagement with what they love. I think it is impossible not to be influenced by the stories we love – we should be influenced — but I do wish we weren’t always being persuaded to buy the t-shirt and toys too! WN: Am I stretching things too far, to see parallels between Laura’s lost father, and the death of your own? EK: The dream Laura has, her own dream, of her father coming tiredly home, then seeing her waiting, and straightening up and hurrying forward to meet her – I had that dream when I came back from the hospital on the night that my father died. It was literally a dream of a real memory, something I’d seen time and again – Dad pleased to see me (and my sisters) waiting for him – and hurrying forward. It was a kind of gift my memory gave me, a reminder like a blessing. WN: What do you want your readers to think about, when they finally put the book down? EK: I keep imagining adult readers, women, reading Dreamhunter and remembering friendships they had when they were Laura and Rose’s ages — friendships like pledges. Other than that I always want readers to put down my books and think not about them, but about the world.